The Sounders are just above the line in the West, with 19 points from 15 matches. After getting off to a slow start in 2017, the defending champs are finding some form, winning three of their last five matches. While they’ve been almost unbeatable at home, the Sounders have only a single away win (a 3-0 victory in April in Los Angeles). Clint Dempsey is currently tied for the team lead in goals with Sounders newcomer Will Bruin (both with four), and designated-player Nico Lodeiro is tied with defender Joevin Jones with five assists. As a club, the Sounders are near the bottom of the league in scoring (18 goals) and defense (26 goals allowed). Perhaps admirably, Seattle is the cleanest club in the league with only 128 fouls committed (while suffering the fourth-most with 209). NYCFC finds itself in third place in the East, sitting on 24 points from 15 matches. They have been inconsistent in their form so far this season, repeating a result only once so far (back-to-back wins at Columbus, then at home against Atlanta). At home they’ve been mostly successful, sustaining only one loss (2-1 vs. Orlando on April 23) in seven matches. David Villa has been blanked in the quest for his 50th club goal, with his last score coming from a brace in City’s 3-0 victory in Orlando nearly one month ago. El Guaje still leads the club in goals for 2017 (8), followed closely by young phenom Jack Harrison (6). 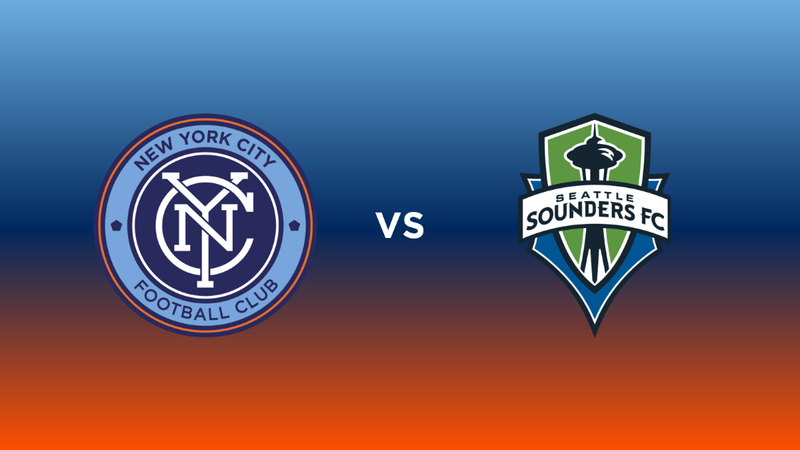 New York will find themselves without the services of their leading creator, Maxi Moralez (7 assists) after he suffering and injury midweek. City are second in scoring in MLS (tied with Houston at 27), but the defense has become far less stingy in recent weeks. The back line that had taken seven matches to let up seven goals to start 2017 has now let six cross the line in their last three contests. In a match that was supposed to see NYCFC return to full-strength, fate had other plans. Returning from international duty are Rodney Wallace, Ronald Matarrita, Yangel Herrera and Maxime Chanot – though only two of the four are assuredly available for Saturday. While Wallace and Herrera are both likely to start, Chanot was pulled from his World Cup Qualifier early with a leg injury, and Matarrita left training early Thursday afternoon. The losses of Chanot and Matarrita, combined with the questionable status of Moralez, makes for a precarious situation. As was the case on Wednesday, City’s depth at Center Back is suspect at best, and Moralez’ absence removes an aggressive, creative, two-way presence in the middle of the pitch. Herrera’s return makes the prospect of starting Andrea Pirlo a little more palatable. Wallace should be able to continue to put in some defensive work on his side, helping out Ben Sweat who has filled in passably for Matarrita. Seattle has a different kind of turnstile on their side. Coming off of a midweek Open Cup match of their own, the Sounders were victorious on the back of a full-squad rotation. As a result, they will have their full, first-choice compliment available and rested for Saturday. Head coach Brian Schmetzer’s only decision will be whether to rest one or both of defenders Joevin Jones and Roman Torres, who played in their respective World Cup Qualifiers Tuesday night. Defense has been a weakness for Seattle, especially on the road where they have allowed 17 goals in eight matches. That said, they have an extremely potent attack that has underperformed to this point in the season. Ring and Herrera will have their work cut out for them against Christian Roldan, Lodeiro, Dempsey and Jordan Morris. Editor’s Note: Maxime Chanot is listed as “Questionable” on this week’s injury report. According to a tweet from Glenn Crooks, there is “not a chance” Chanot doesn’t play Saturday.